Don Krampe reads the American Creed to a large audience attending today's Memorial Day event at Town Square Park. 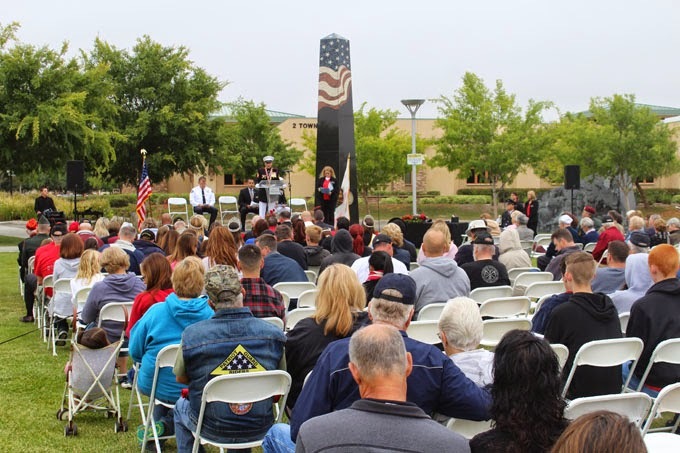 Murrieta residents, including veterans and city officials, gathered at Town Square Park this morning to recognize Memorial Day and honor those in the military who died protecting our country. 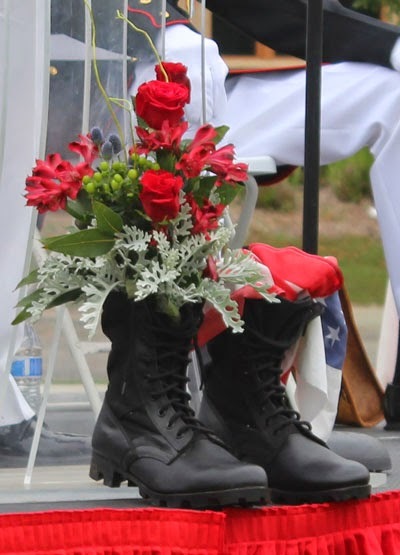 The ceremony took place just a few yards from the Local Heroes Field of Honor, where dozens of flags were displayed to honor local military personnel who died in the line of duty. On the podium was placed a pair of empty combat boots in honor of the fallen. A ceremony was also held later in the morning at Laurel Cemetery. 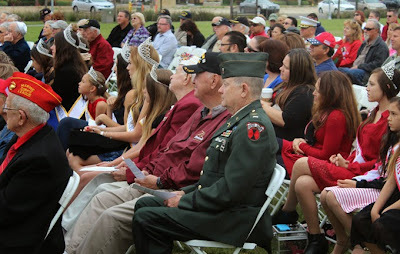 Opening remarks were made by Murrieta Mayor Harry Ramos, himself a veteran. "This is not about barbecues," Ramos said after telling the story of his meeting with a woman who had just learned her husband was killed in action. "It changed my whole perspective on Memorial Day. Then I started getting deployed and it really changed my perspective. "Something my drill sergeant told me in 2002 was, 'We went there so the bad guys can go and fight us instead of them coming here to fight us and attack our families.' So I don't think it's in vain. The people who went over there served honorably and did the right thing." 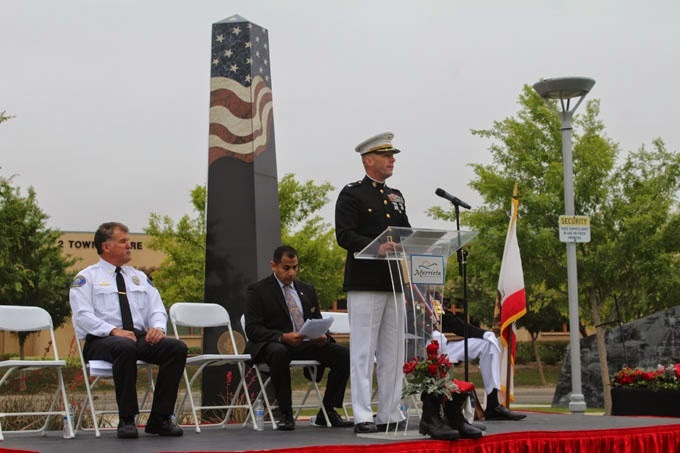 The keynote speaker was Col. Jim Hensien of the 1st Marine Division at Camp Pendleton. It has Marines serving in 23 countries around the world. "The reason we have our forces deployed out there today is the same reason we've had them deployed throughout our history," Col. Hensien said. "They are out there today to preserve our self-determination, that sacred right to determine our own fate. The price of our freedom has at times been high, but we have never been unwilling to pay that price. They are out their continuing that important work of those we honor today." The presentation of colors was made by the MCJROTC unit at Murrieta Valley High School. Murrieta City Council members read proclamations in honor of the day and Dora Ridgeway sang the national anthem. Col. Jim Hensien addresses the crowd during the Memorial Day ceremony. Seated behind him is Mayor Harry Ramos. 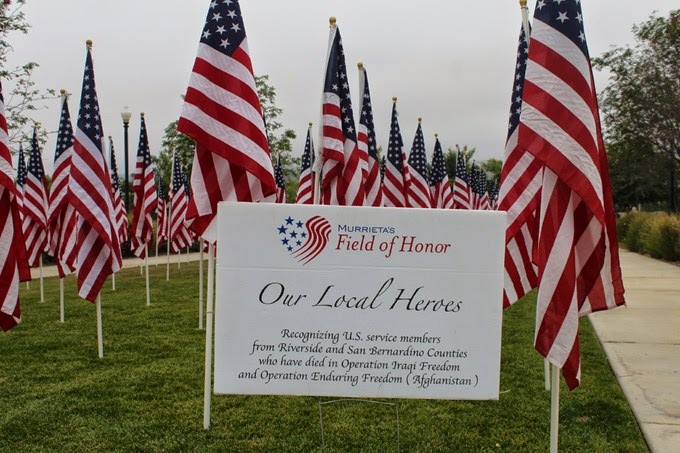 Flags in the Local Field of Heroes honor local service members who died in action.